EuroBlech visitors last October in Germany got a good taste of how to improve the productivity of their fastener-insertion processes at the booth of Haeger, Inc., which displayed two of its newest products—the WindowTouch-3 that features a new and improved turret tool, expanded networking features and capabilities, and new laser part-locating light. InsertionGraphics software provides a visual guide to the operator throughout the insertion process. The new Turret Insertion System (TIS-2) enables a metalformer to insert as many as four different fasteners in one part-handling operation. And tool-position feedback helps eliminate missing fasteners by preventing the operator from moving to the next fastener until all of the current fasteners have been inserted. 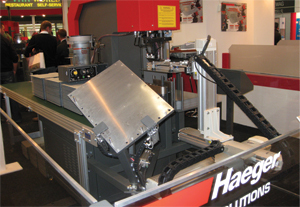 Haeger also displayed its OneTouch-3 with robotic integration, for customized automated hardware-insertion cells. It employs Motoman robots with part-handling capacity from 6.6 to 1100 lb. A servo-driven tool changer offers 3-sec. automatic tool changes; the machine offers part clearance to 5.5 in. ; and, as with the WindowTouch-3, the unit can insert as many as four different fasteners in one material-handling step.